Apple’s recent product launch on 12 September has cast into the mainstream technologies that were first envisioned by Mark Weiser in the 1990s, when he was Chief Technologist at Xerox’s Palo Alto Research Center (PARC). Though Weiser died in 1999, at the age of 46, his ideas continue to inspire cutting-edge smartphone innovations. The release of Apple’s new iPhones and operating system this Fall signals a new stage in the tech industry’s commitment to making Weiser’s vision a mass market reality. Now is a good time to revisit Weiser’s ideas; his work foreshadows how our smartphones and the ways we use them may soon change. Weiser’s pivotal role in sparking the post-desktop revolution owed much to his humble beginnings as a dropout philosophy student. (He later became a tenured professor of computer science without ever obtaining an undergraduate degree.) The three semesters Weiser spent at New College of Florida paint him as an east coast Steve Jobs, and there is much to glean from the comparison. Both were “humanities kids” of the shaggy hair variety. Around the same year Jobs sat in on calligraphy courses, Weiser penned term papers on Plato, Wittgenstein, and Heidegger. Both men went on to preach liberal arts virtues to the Silicon Valley engineers they would lead. Their respective roadmaps for future mobile devices, however, proceeded in very different directions. While Jobs’ push to expand the digital world ad infinitum effectively defined the past decade of handheld computers, the 10th anniversary smartphones this year is paying homage to Weiser and his mission to integrate the content of the Internet with the everyday settings and locales we each inhabit here and now. The disparate ways in which we use our mobile devices today owe much to these lasting tensions between Weiser’s philosophical ideals and Job’s design strategies. A nearly universal selling point that has spurred the rise of smartphones (and the decline of desktops) is the utter convenience of handheld hardware. Smaller form factors allow people to use computers on the go. But to what ends? For Jobs, portable screens represented new avenues to expand the Apple universe his users had already grown to love on their stationary machines. A document created on one’s iMac carries over to one’s iPad and MacBook, via iCloud. The iPhone works hand in glove with Apple TV and Apple Watch. Job’s quasi-monopolistic insistence on “end-to-end control” bequeaths a parallel level of command to his customers in this multi-device context. If you buy into Apple across the board, then the stuff of your desktop becomes available on-demand, anytime, anywhere. The disparate ways in which we use our mobile devices today owe much to these lasting tensions between Weiser’s philosophical ideals and Job’s design strategies. Weiser foresaw this scenario, and he wanted little part of it. He believed that mobile interfaces and the cloud marked an opportunity to reinvent computing beyond the desktop—not to enlarge the purview of desktops. This was an odd view to hold at Xerox PARC. Desktops were more or less invented at PARC before Weiser joined the Palo Alto-based lab in 1987. Publishing articles with titles like “The Computer for the 21st Century” and “The World is Not a Desktop,” he quickly inspired his R&D colleagues to make a 180-degree turn. So many innovations that will likely define the next decade derive, at least in part, from an odd lineage of old technologies (e.g., eyeglasses, white canes, candy wrappers) that sparked Weiser’s ideas twenty-five years ago. For example: “Eyeglasses are a good tool—you look at the world, not the eyeglasses. The blind man tapping the cane feels the street, not the cane.” Like the blind man’s cane, ubiquitous computing operates through movement and contact; both afford their beholders a mode of knowledge that is utterly dependent upon environmental input. The cane without the street is just an expensive stick. A mobile device without contextual awareness is a cheaper desktop. Candy wrappers and streets signs, too, play surprising roles in Weiser’s thought. These embedded texts envelop the objects and settings that comprise our public spaces. Through them, we read our way through the world at a glance. They are the cultural infrastructure of habit and habitus. To Weiser, candy wrappers and the like represented “the real power of literacy,” and he pioneered early efforts that brought to computing this same sense of reciprocity between texts and environments. Good tools, in light of Weiser’s legacy, are not just extensions of one’s mind or body. More profoundly, technologies at their best may serve as liaisons, linking each of us to subtleties in the dynamic, singular, living patch of earth we inhabit right now. The apex of Weiser’s prescient ambitions are still ahead of us, unreached. We have hit a point, though, where almost every “next big thing” in tech builds on his early blueprints. With each new app inspired by Pokémon Go and every 9-figure investment in startups like Magic Leap, mobile and wearable interface stand to become a little less like miniaturized desktops and a bit more like a digital looking glass we point toward the world around us. Featured image credit: smartphone movie taking pictures by SplitShire. Public domain via Pixabay. John Tinnell is Assistant Professor of English at the University of Colorado Denver. His essays and articles have appeared in the Boston Review, Computational Culture,Convergence, Deleuze Studies, Enculturation, Environmental Communication, and The Fibreculture Journal. With Sean Morey, he co-edited the collection Augmented Reality: Innovative Perspectives across Art, Industry, and Academia (Parlor Press, 2017). 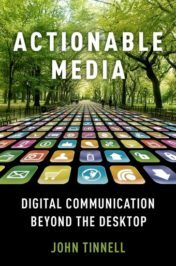 He is the author of Actionable Media: Digital Communication Beyond the Desktop.